We started our family business as we struggled to find organic, vegan and cruelty-free perfumes made in Britain that we loved. d) we will never sell our perfumes in countries where animal testing is compulsory. We officially launched Flaya in Summer 2017 at the Great Yorkshire Vegan Festival in Leeds. We had a fantastic day! Not only did we sell lots of perfumes but we also met many like-minded people and made purchases from other ethical and vegan businesses / charities. Since then, we’ve started to sell to independent and ethical shops, salons and therapy centres in England, Scotland and Wales. When we contacted Ross and Pauline at The Green Shop in Berwick, they mentioned the instrumental work of Naturewatch Foundation: to end wholly unnecessary and cruel animal testing for good. We were familiar with the Compassionate Shopping Guide and immediately sought endorsement from Naturewatch Foundation for all our perfumes. The Fixed Cut Off Date (FCOD) is common sense for any animal lover and fits perfectly with the Flaya ethos. The Compassionate Shopping Guide updates shoppers with relevant changes e.g. company take-overs. Naturewatch Foundation does the lengthy and complex research so customers can see at a glance which companies are genuinely cruelty-free. Should perfumes be sprayed into a rabbit’s eyes to determine if they may irritate human eyes? No! Should a dog be forced to drink a bottle of perfume to see what happens? Never! Should a mouse be covered in a solution of perfume to assess potential skin irritation for humans? Absolutely not! Would an animal, if asked to participate in excruciatingly painful, harmful and potentially fatal procedures, agree without hesitation. We think not! Traditional animal-derived ingredients used in the perfume industry include castoreum, civet, musk and ambergris. If you’re not already familiar with these ingredients, search for them on the internet. You may well be appalled. Traditional ingredients are now often replaced with cheap synthetic raw materials. The use of synthetic ingredients, however, is certainly not something we will entertain. We’re committed to sustainable and organic principals and knew from the start that we wanted to use genuinely natural, plant-based ingredients. No synthetics, parabens, phthalates, SLS, SLES, etc. We’re proud that our perfumes contain between 80 and 92% certified organic ingredients.Moreover, we are aware of our impact on the environment and restrict the use of plastics. 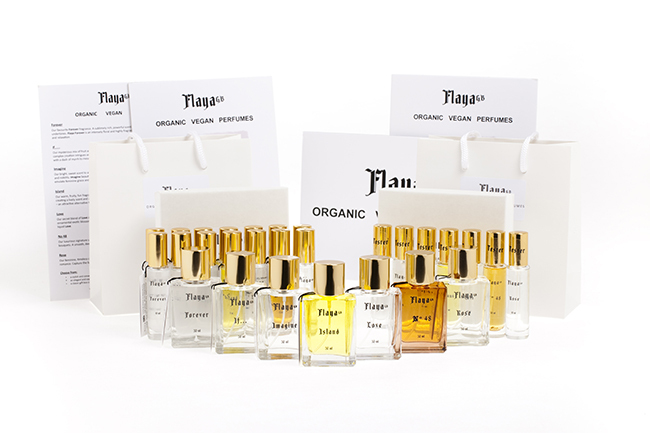 We therefore bottle our perfumes in glass, minimise our packaging, use vegetable based inks and solar power. Ultimately, we are proud to put our principles, animals and the planet before profit.